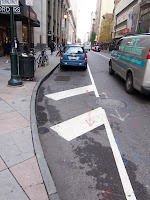 Center City Philadelphia's sidewalks have an awful lot of uses, anyone who has walked on Chestnut or Walnut Streets during lunch hour knows of the competition between pedestrians, sidewalk cafes, street furniture (such as bike racks) and even illegally parked cars. The Portland configuration was 26 bikes parking spaces for 1.5 parking spaces. That translates to 16 to 18 bikes per parking space area. While the battle to remove even one space of on-street parking on a block will no doubt incur opposition from some business owners, other businesses should be able to see the positive impact. After all trading the convenience of one customer for 18 others (and countless pedestrians) doesn't sound like a net loss. Good parking and delivery management practices will ensure that those who insist on driving will find a place to park their vehicle while offering the carrot of more convenient bike parking. But do you always have to take away legal parking? The Borders book store at the corner of Broad and Chestnut always seems to have a dozen+ bikes parked on racks, signs and street trees. 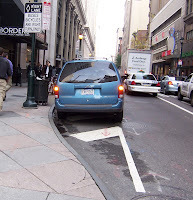 There is a hashed no parking space in front of the store that could easily fit several hitch-2 bike racks as the illegally parked minivan in the second photo demonstrates. My friend donated some much needed bike racks in downtown West Palm Beach, in memory of my brother. I thought you'd like to check them out.